There have been many outrageously themed motels, hotels and restaurants constructed in Las Vegas these past 75 years but few have been as over-the-top fabulous as the Dome of the Sea. Of everything ever to appear on the strip it was my favorite, with the Landmark and Sands Hotels coming close behind. The Dome of the Sea, constructed in 1964, protruded emphatically from the south end of architect Milton M. Schwartz’s 21-story ultra-Modern north tower that rose from the desert in 1961. Schwartz was especially proud of the building, saying of the restaurant’s unusual form in a 2005 interview, “The Dome of the Sea was something I had always wanted to design. It was a circular building and it looked like it came from outer space. It just felt like it fit on the desert to me.” Amen. The Dunes in 1964. Dome of the Sea is at bottom left. The salaciousness of this illustration is freakishly refreshing. This menu is one of the most beautiful in my collection. You can sort of tell from the photo that the actual menu cover is made of a meshed plastic that gives the appearance of shimmering water. On the menu was my favorite dish from the world of continental-style fine dining: Lobster Thermidor. After the Dunes closed in early 1993 its contents were auctioned off. Later that year, new owner Steve Wynn imploded the Dunes property to make way for his ostentatious Bellagio. I couldn’t (and still can’t) bear to watch the demolition footage. I was told that the soaring Dunes sign was still operating – with the progressive red neon outline of an Arabic tower continuing its ascent – a few moments after it began toppling to the street. Gallery | This entry was posted in Home and tagged 1950s, 1960s, Bellagio, bizarre, cocktails, Dome of the Sea, Dunes, Fine Dining, gambling, historic restaurants, hotels, Las Vegas, lounge, lounge act, menu, Milton Schwartz, modern architecture, postcard, rat pack, restaurant, retro. Bookmark the permalink. Thank you for sharing this great article. My father was a violinist at Dome of The Sea when Arturo Romero was there. His name was Manuel Martin and I remember how beautiful the restaurant was. I had my 15th birthday there and I remember standing just outside the restaurant Iwas able to meet Carey Grant. I dont remember why he was there but I was awe struck. I dont think I washed my hand for a week. Anyway, I remeber all of the musicians coming to my table and playing for me and it was wonderful. I also remember how everyone in the casino was dressed to the nines. It was a wonderful time and I miss it. Thank you for the memory. Greetings! How fabulous that your dad was a violinist at Dome of the Sea!! I’m coming out with a new pictorial history book titled “Greetings from Las Vegas” that should be available next Fall. I cover the Dunes in much greater detail. I am Milton Schwartz’s daughter. My mom and I remember Arturo fondly. My mom still has his record. In fact, my recollection of the story my father told me is that he was given an unlimited budget by the owner of the Dunes (Jake Gottlieb) to travel anywhere in the world to get ideas to create the best restaurant in the United States. He chose to travel to Mexico, where he met Arturo and his colleagues, including your father, who inspired him to design the Sultan’s Table. It was completely designed around the violinists who would surround the patrons with their beautiful music and it ended up winning the Diner’s Club Award for the Best Restaurant of the Year. 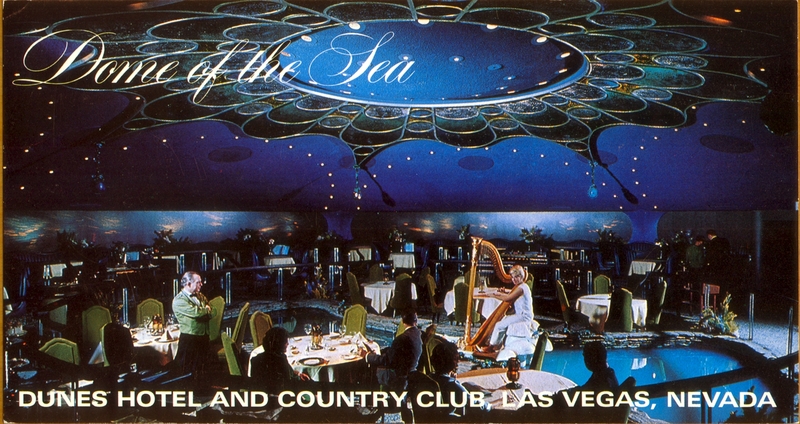 The Dome of the Sea was designed later, with the Harpist as the main event. I also have wonderful memories of visiting Las Vegas in those years, despite the fact that my father was away from home for 10 years designing and overseeing all of the structures; but, he would come home every weekend to spend time with his family. Thanks for keeping the memories going! Sandy, it’s great to hear from you again! 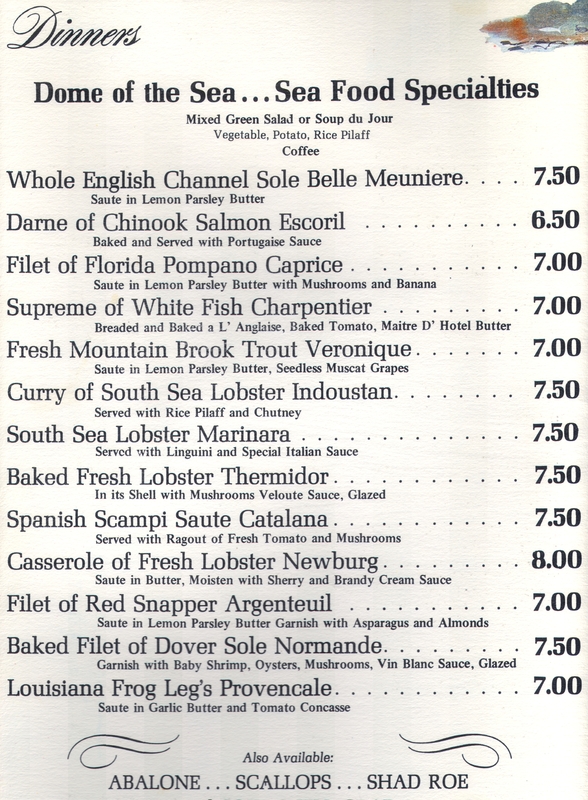 Both the Sultan’s Table and Dome of the Sea were among the greatest of fine dining restaurants that existed in Las Vegas during its classic period. My new Las Vegas book should be out by late summer. Hi! My Dad was the big-band orchestra leader at The Dunes and then at The Thunderbird from about 1970 – 1977. He accompanied so many greats, like Sarah Vaugh, Mel Torme and Edie Adams to name a few. If you ever come across pictures of the marquis with his name on them, I would LOVE to see them. Great site. Brings back a lot of memories! Be sure to visit the photo archives at UNLV Special Collections and the Nevada State Museum at Las Vegas (the latter has the fabulous Las Vegas News Bureau publicity photographs that include quite a few hotel marquees). Hi! My Dad was the big-band orchestra conductor at The Dunes from roughly 1970 – 73. Then he was at the Thunderbird probably from 73 – 76-ish. I am trying to reconstruct his professional life, since he passed when I was pretty young. If you come across pictures of either marquis when his name (Joe Berlingeri) is featured, I would LOVE to see them!!! My parents took me to Vegas in 73 when I was five. I remember the Dome of the Sea fondly. I told my parents that I wanted to have my wedding at the Dome of the Sea. One of my memories is falling asleep in the resturant while eating Lobster Savanah. The time difference was just too much for me. My Dad still has one of the menus from there. I’d like to know more about Lobster Savannah! 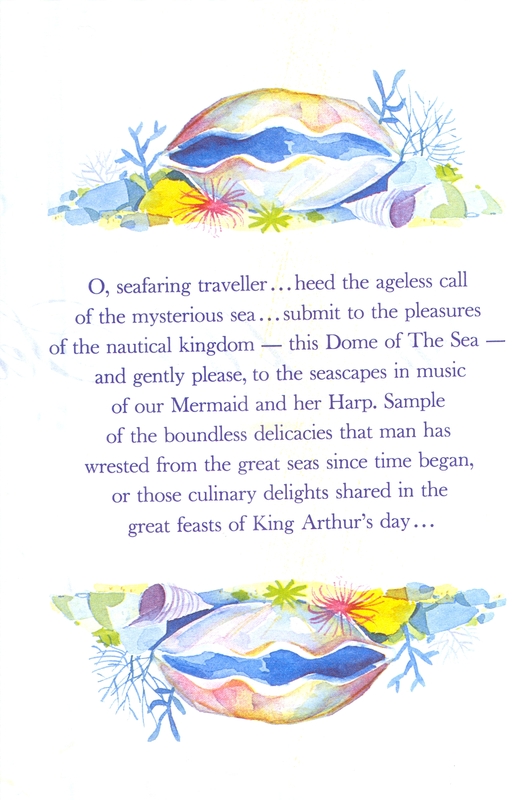 I think that the Dome of the Sea menu is my favorite menu in my collection. So colorful and shimmery. How wonderful! Is your dad’s menu the same as the one in my blog post? Sandy, I’m honored that you found my blog and commented favorably on my Dunes/Dome of the Sea post. Your father was an especially talented architect whose designs epitomized the excitement and glamour of the mid-century modern era. Milton M. Schwartz will not be forgotten. You’ll also be pleased to know that my new book, “Classic Dining: Discovering America’s Finest Mid-Century Restaurants” that will be published this July and includes a section about The Dunes and Dome of the Sea! Peter – I’ll be looking for your book! Thank you for all your wonderful accolades of my dad and his work. I have very much been enjoying your work as well! On March 5th 1976 my wife and I had our wedding day dinner at the Dome of the Sea. I will never forget that night and how elegant this restaurant was. I am so sorry to see it has gone. If it is ever duplicated at another hotel (and it should! ), we would probably make a special trip to Las Vegas just to eat there. I agree that the Dunes was a great place. Too bad we have to always get rid of the old to accommodate the new. Dr. Phillips – I am Milton Schwartz’s daughter and I am so flattered by your comments as I know he would be. He loved designing the Dunes, the Dome of the Sea, and the Sultan’s Table. He told us many stories about his experiences there, particularly since the entire project took nearly 10 years for him to complete. He would would be so tickled and appreciative of your complementary response, which certainly warms my heart and brings back so many wonderful memories of him. Thank you! Indeed! The Dome of the Sea was a magical place. I miss it terribly. So many restaurants now are “loud music oriented” and makes the dining experience stressful. The lady playing the harp was magnificent. I’ve never been to another restaurant with as much class. What happened to class? “Class” as you and I define it is rare in restaurants these days. However, there are survivors. My upcoming book “Classic Dining: Discovering America’s Finest Mid-Century Restaurants” finds them. 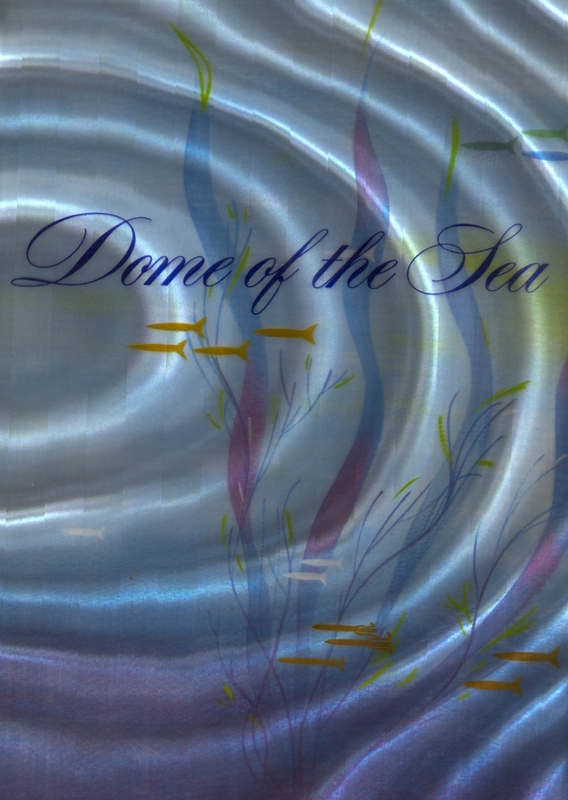 I fondly remember the Dome Of The Sea restaurant and miss it terribly. I can still see the fish “swimming” on the walls! What an amazing idea to have a beautiful “mermaid” in a moving boat on a pond playing a beautiful song on the harp! Thank you Peter for sharing your fond memories with us. I love Las Vegas but as you say, everything keeps changing. The menu was fun to look at as well- especially the prices! I will look foreward to your book. thank you. I find it amusing, as the previous comment has stated, that the waiter standing at left is actually one of the most prominent elements in this photo – even more noticeable than the golden-haired harpist herself. His folded-arm stance implies disapproval. How could the photographer have chosen to pose him in this well-lit position, and with such an attitude? Meanwhile the actual diners – few as they are – are mere silhouettes in the dark.